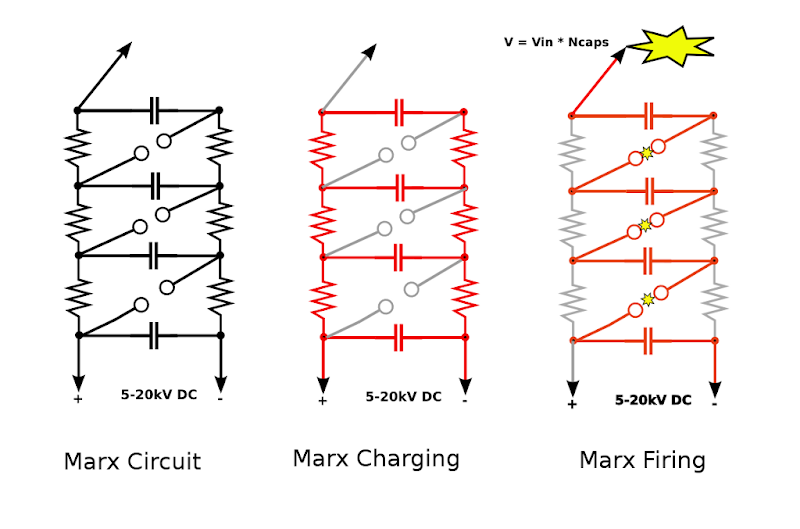 When you want to generate large pulses of terrifyingly high voltages, the tool of choice among the potentially inclined is the Marx Generator. This deceptively simple device is built using nothing more than capacitors, resistors and spark gaps. It takes a relatively low voltage input, generally in the range of 5-20kV, and spits out a pulse that is multiplied in proportion to the number of capacitors in the device. So even with just 10 x 20kV capacitors, its possible to generate a juicy 200,000 volts that can jump close to a foot. The picture on the masthead of this blog shows an actual Marx generated spark as wide as my face. In the charging state, all capacitors are charged in parallel. Eventually the voltage across them all is high enough to cause a spark to jump across a gap, and the sparks cascade up all the gaps. The sparks appear as a very low resistance path, much better than the resistors, and the caps now are effectively wired in series, multiplying the voltage by the number of stages. The drawing below shows the basic circuit, the effective charging circuit, and the effective firing circuit. Being the spark aficionado that I am, I had to make one. At very high voltages (greater than 100kV), many things that you normally think of as insulators have an annoying habit of turning into conductors. Wood is one of these, so my generator had to be based off a plastic chassis. Some long slender pieces of Perspex did the job, with silicone sealant holding it all together. I cut enough for a 20 stage Marx. 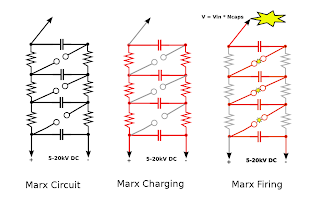 On a Marx, the only metal allowed is stuff that is supposed to be carrying voltage. For the resistors, they need to be high voltage rated. Regular resistors will arc over internally and go high as the internals burn up. So I found a source of VR37 resistors, rated at 3.5kV, via my local overpriced RS Components. I figured 1.2M would do (though looking back I wish they were lower). I snarfed a bag high voltage capacitors off eBay from a Chinese seller (2.2nF @ 15kV) for a decent price. And when they arrived I found out why the decent price. Supposedly rated at 15kV, any voltages above 10kV instantly killed them. Couldn't be arsed trying to chase up the seller, so the Marx had to be rated at 9kV input. The sparks gaps are made from wire loops. Tuning them was done by applying 9kV until they just managed to arc reliably. I also added a safety gap at the input, to ensure any overly high voltage on the input would arc away before killing the caps. Think of it as a sort of fuse. I've insulated all connections with silicone to prevent corona - this can really kill performance as much of the energy wastes away to the air. As the ground for the spark to jump to, I used an old telescopic antenna, letting me freely adjust it into the desired position. Powering the lot is my flyback supply, wound back so as not to overload the caps. When running, this Marx fires at about 0.5Hz, with nice juicy 15cm sparks. An interesting thing I noticed is that when the spark from the top cant reach ground, all that happens is that there is a small muffled pop from the spark gaps and a cone of blueish corona around the top. Normally the spark gaps light up brightly together with the main spark. And like anything involving loud noises and electricity...the next one will be bigger!